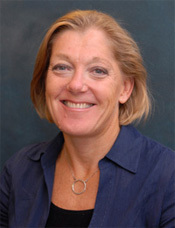 My daughter recently sent me a link to a podcast entitled “How Stupid is Our Obsession with Lawns?” You can find it at WYNC Studios Freakanomics. I was listening to an explanation of how we became obsessed with lawn and why it is not a great idea for the environment, when to my surprise, I heard a man from New Castle, Delaware start to speak. He described what a shame it is to have miles of mowed roadsides and the missed opportunity for pollinator habitat and other ecosystem services. He specifically mentioned the I95 rest area in Delaware. Good news – DelDOT is already in the process of changing the mowed lawn syndrome on Delaware roadsides and is installing two major plantings along I95. The large mound at the north end of the rest area was planted with clusters of eight native trees, 48 in all. Small trees were planted because they are more likely to survive the tough roadside conditions. Once they establish, they will provide shade, flower color and fall color for motorists travelling the I95 corridor. The mound was also planted with a mix of grasses and forbs attractive to pollinators. 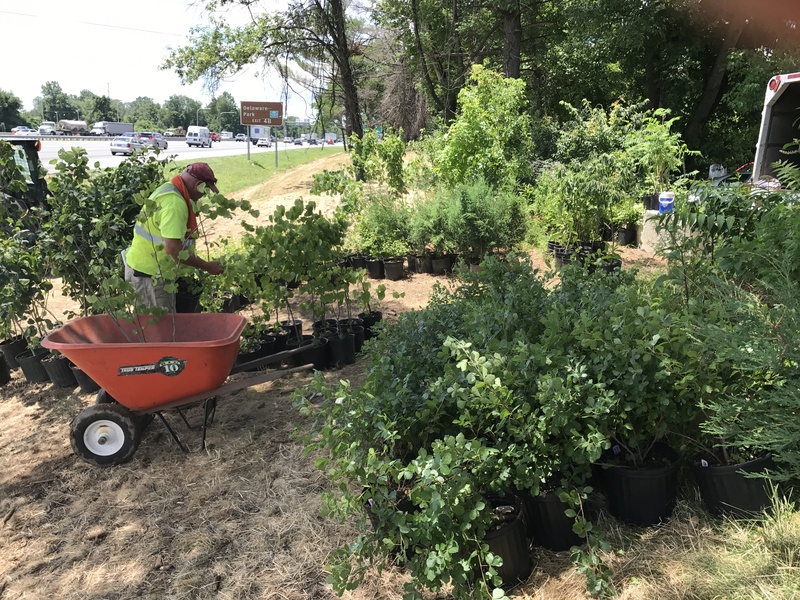 A second planting of over 400 native trees and shrubs was installed last week along southbound I95 between the Route 141 and Route 7 exits. The first step was to seed a pollinator meadow. Next, the locations of each plant were marked with a flag or spray-painted “X”. It took almost one full day to unload and stage the plants close to their planting sites. Then planting began. Large shade trees, including scarlet oak, sour gum, sweetgum and red maple were installed. Grove-forming trees, pawpaw and persimmon, should spread into large native clusters. Redbuds will bloom with pink flowers in the spring and blackhaw viburnum will have large clusters of white flowers a bit later. Eastern red cedar and American holly will provide some evergreen cover for the salvage yard on the other side of the right of way. A wide variety of native shrubs will fill in to provide a complex native landscape. We reap so many benefits from this type of landscape beyond the obvious fact that is simply looks much more interesting than mowed lawn. We provide habitat for pollinators and other wildlife. We allow water to soak into the ground rather than run off into ditches and surface water bodies. We clean the air, removing pollutants and particulates. In addition, we sequester carbon. DelDOT has also reduced mowing along Route 1, mowing only a beauty strip on the edges of the medians and mowing just past the ditch line on the roadsides. Some medians have been seeded with native warm season grasses and others have been allowed to grow with existing vegetation. Keep an eye on these locations as plantings develop and see how Delaware roadsides can make a difference for the environment! Plant staging for the I95 southbound planting between Route 141 and Route 7 exits.